I am sure that you like it as well, because shoes are along with diamonds girl’s best friend. When I saw this pattern, I thought this is my opportunity to struggle more with applique. Of course I made this last summer and you may think that I exaggerate, but never mind. I needed an excuse. I bought the pattern here and chose my fabrics. I printed whatever nedded and I am ready to start. 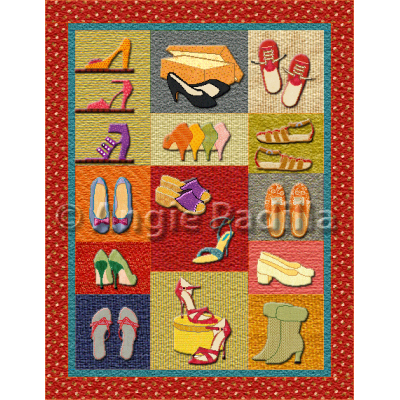 If you want to quilt along or make it inn your own pace, you may either buy the pattern or sketch some shoes, if you are good at it. Next Γιατί ένα ζευγάρι παπούτσια ποτέ δεν είναι αρκετό….